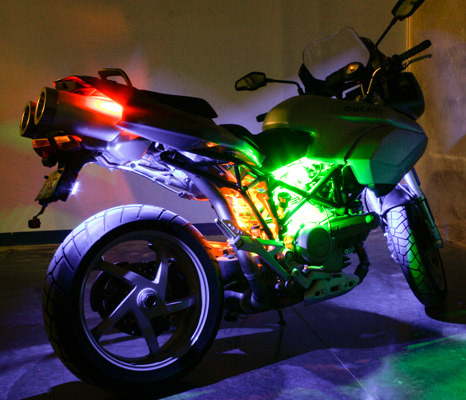 Motorcycle Engine Color Changing RGB LED Lighting Kit: Kit Contents. 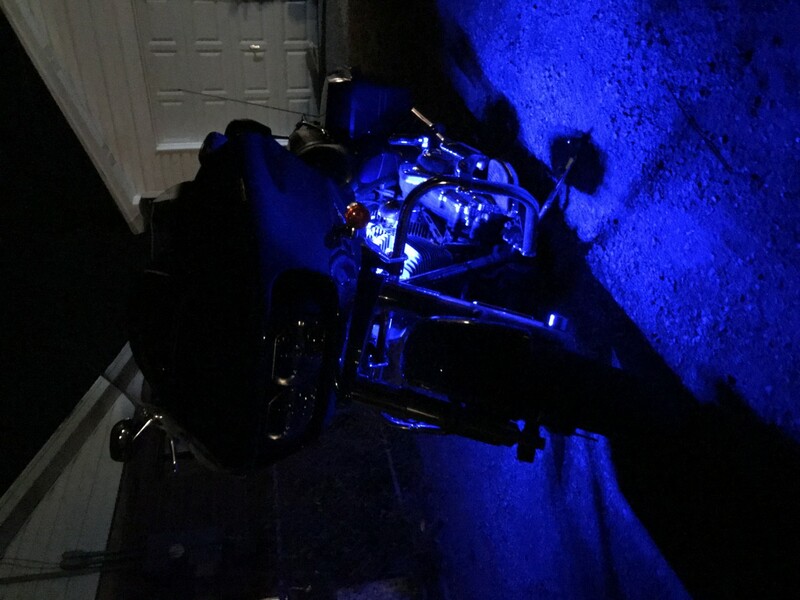 Motorcycle Engine Color Changing RGB LED Lighting Kit: Shown Set Up For Battery Connection. Specifications are provided per individual strip. Please check your state and local laws before installing the kit. Every state has different policies and procedures for aftermarket accessories. 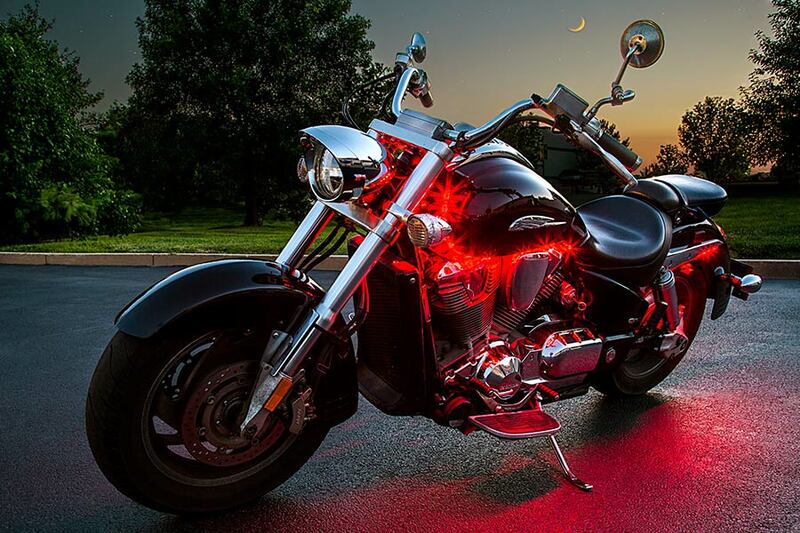 Super Bright LEDs, Inc. is not responsible for any fines that you may incur while using the motorcycle engine lighting kit. 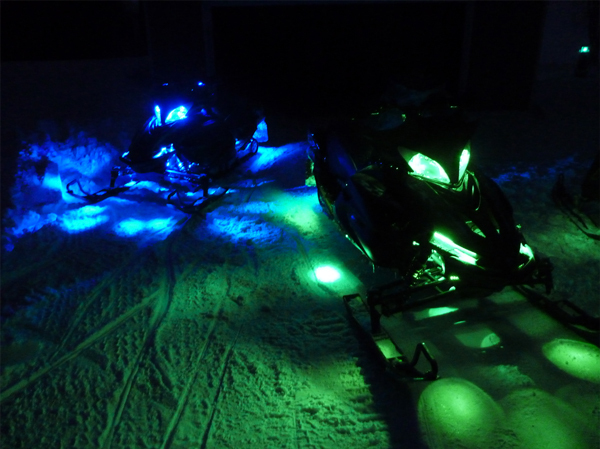 This kit is designed for off road use only. Cut strips to appropriate length using scissors on lines indicated with scissor icon. 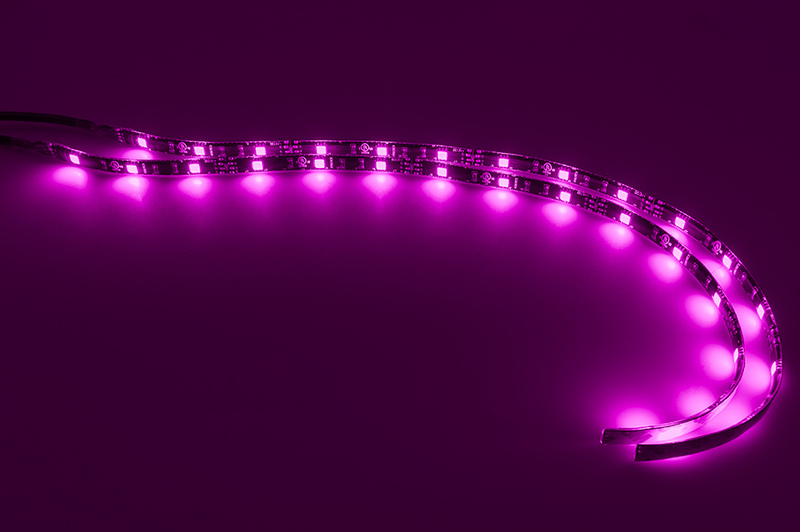 Strip can only be cut on these lines, when cutting, be sure to cut the strips in groups of LEDs that are in multiples of 3. Cutting the strip in the wrong location will cause the strip to fail, and void warranty. Never use with other than included 2 Amp/12 Volt fuse, do not exceed 1.5 Amp maximum load. If you are blowing this fuse, it means you have a short somewhere in your wiring. Using a larger fuse could result in a fire and damage to wiring and product. 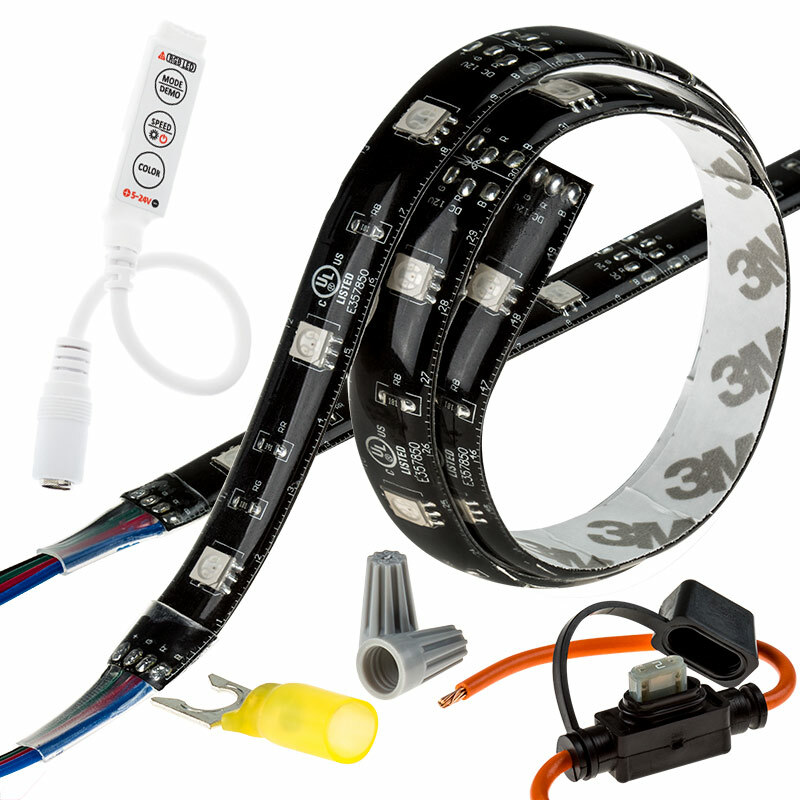 Briefly connect the strips black common positive wire to positive (V+) on battery, and Red, Green, and Blue negative wire to negative (RGB) on battery to test for proper light operation. 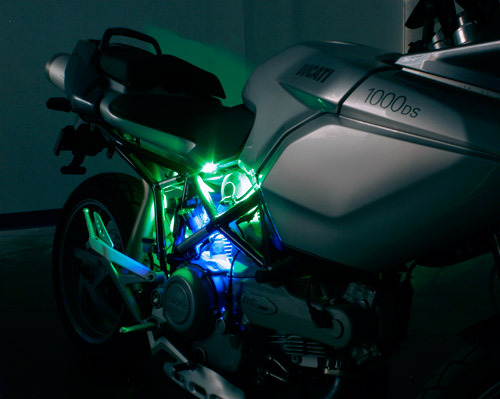 RGB strip should illuminate all colors rendering White light. 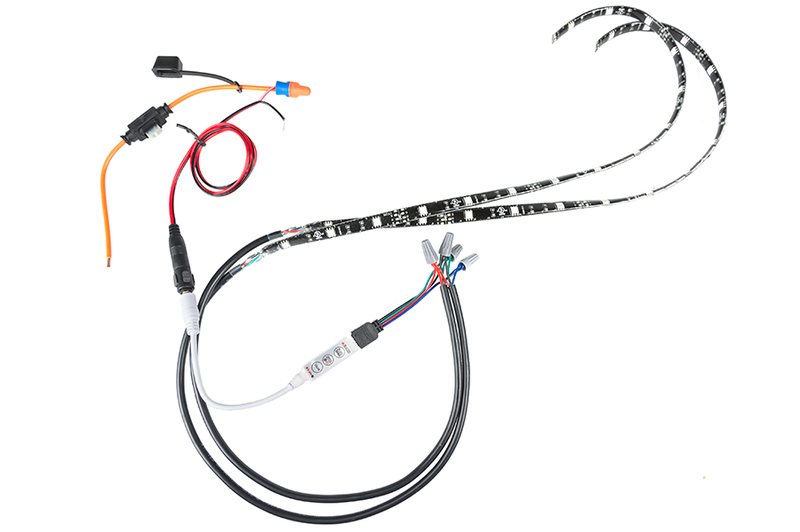 Hold light strip under gas tank or desired accent location to determine the length needed for your installation. Strips may be trimmed. See cutting details below. Make sure wires can be routed in a such a way that they will not be pinched, cut, or exposed to direct heat or moving parts. If a power wire is pinched it could cause the kit to malfunction, and may void the warranty due to physical damage. 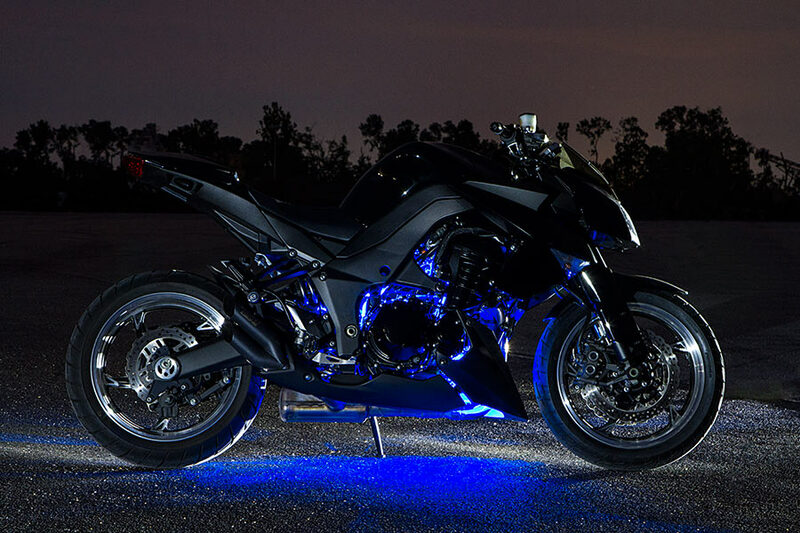 Make sure motorcycle is cool; mounting surface should be between 45°F ~ 80°F to achieve strongest bonding results from strips adhesive backing. 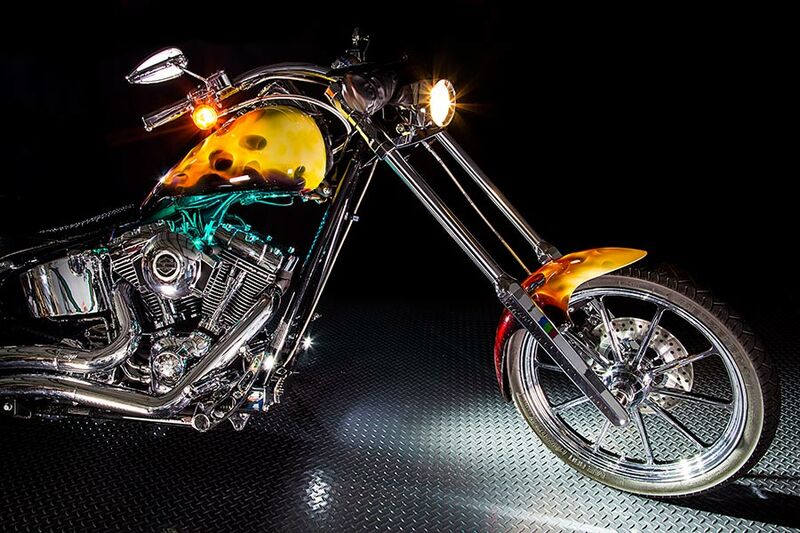 Motorcycle should be parked on a flat surface and secured for installation. Ensure installation surface is clean and dry, free from any oils, dirt, wax, and moisture. Locate battery and unhook the battery negative (-) cable. Remove seat or side covers as needed to gain access to this area. Starting from the front of the tank with the strip’s wires to the rear of tank, begin to remove strips backing while adhering to underside of tank near frame. Press firmly to secure strip to surface. Repeat for other side of tank. Using the diagram as a guide, connect black, green, red, and blue wires wires from both strips along with the black, green, red, and blue wires from the RGB adapter cable to the four wire nuts. Connect the adapter cable’s gold 4-pinned end to the MLD-RGB4-CPS controller. Make sure the polarity symbol on the MLD-RGB4-CPS controller lines up with the arrow symbol on the RGB adapter cable. 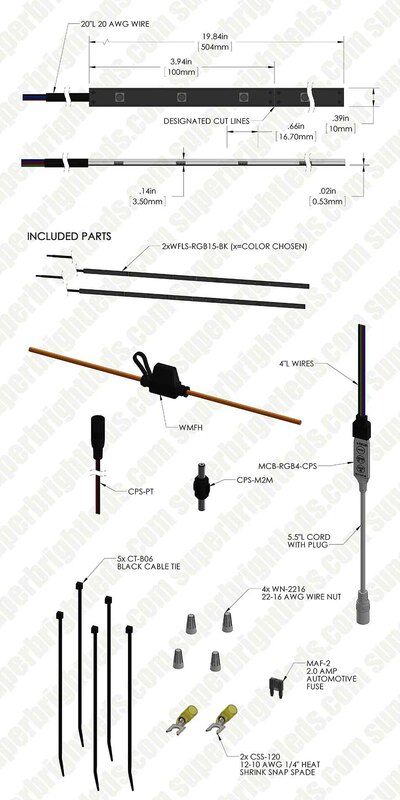 Ground the black wire from the CPS-PT pigtail to the frame or negative battery terminal using the supplied snap spade. Connect the red wire from the CPS-PT pigtail to the mini fuse holder with a wire nut. Connect the other end of the fuse holder to a positive battery supply using the supplied snap spade. Insert the male to male CPS-M2M adapter into the CPS-PT adapter then insert into the CPS socket on the MLD-RGB4-CPS controller. Mount the controller to a convenient location below the seat using double-sided adhesive foam pads and large zip ties. Reconnect battery negative (-) cable and test. I like everything about them, easy to connect, good adhesive backing. They are great. Only one issue.wish the leads were longer. I can improvise. 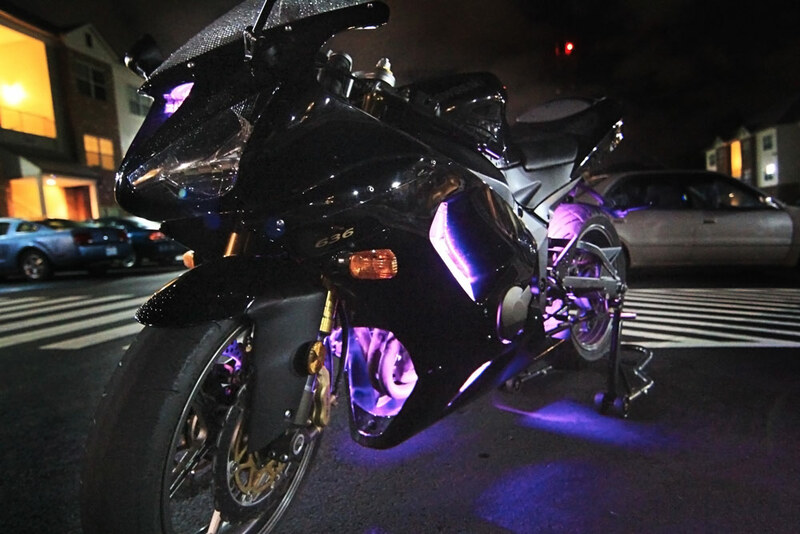 Everything you need to light up. Much better quality than parts store kits. 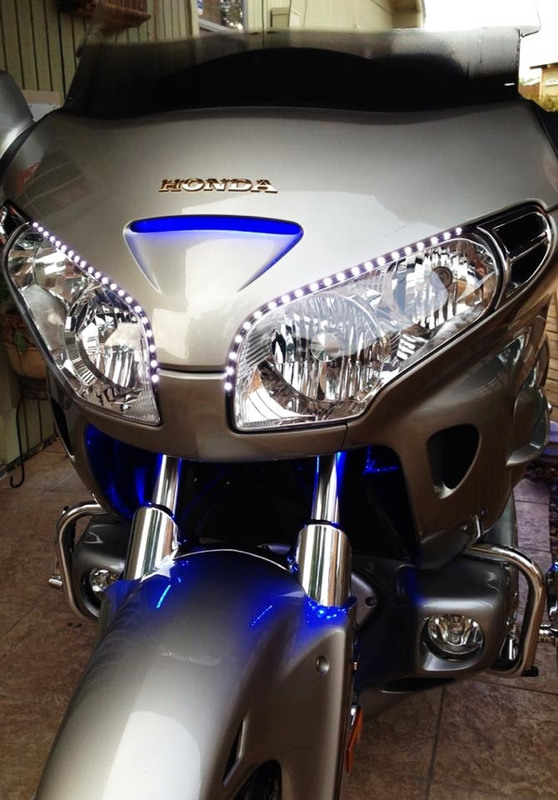 I really like these lights, they are bright enough to help you be seen on your motorcycle but not so bright that they are distracting to the rider. 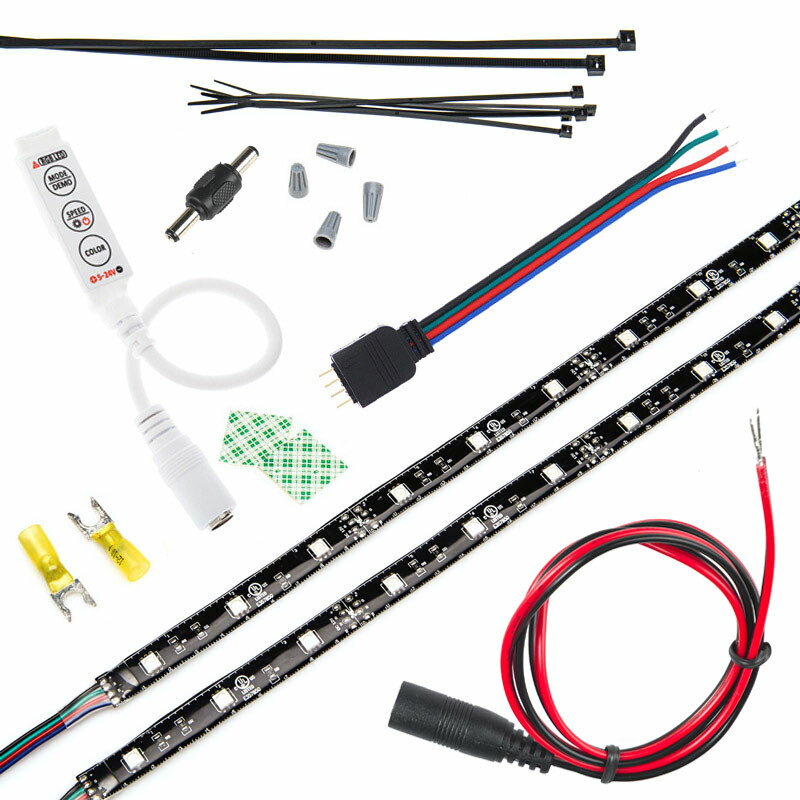 The installation was simple and the kit comes with everything needed. The only thing I didn’t like was the 12 gauge wire was overkill for the application. Doesn't connect from conto unit as good as it should. Doesn't stay in place.